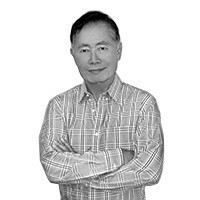 The acclaimed ‘Star Trek’ actor and social activist writes about his own experience in Japanese internment camps in the 1940s, and how there is a way out of the darkness ahead. It is now the week after the election. Since the result on Tuesday, hundreds of thousands have filled our nation’s city streets in unprecedented protests, even as reports grow of widespread verbal and even physical attacks on minorities and LGBTs by forces emboldened by the outcome. Many legitimately are asking: Where do we go from here? Permit me to share some personal experience. When Japanese Americans were sent away to internment camps during World War II, simply because we looked like the enemy, we had legitimate fear of angry mobs, as well as a deep and utter despair over a country that had turned its back, not only upon a whole group of its own people, but upon its very values. But amidst all the unfounded hate and suspicion of us, there were also many good Americans who came to our aid: neighbors who offered to look after farms, homes and pets; Quakers who visited us in camp to bring vital services and monitor our treatment; lawyers who filed suits on our behalf and saved tens of thousands of us, including my own mother, from being deported. Even in the darkest of times, there were so many ordinary heroes who gave us hope and succor. It is they whom I remember most today. It was they who helped change things for the better. There are many who rightly feel afraid for what will happen next. But hard as it is to face, we must remind ourselves that fear is the favored weapon of bullies and thugs. Fear can make us turn away from our hopes and give in to mistrust and cynicism. Let us instead take each moment of fear as a challenge to stand up ever taller. When my community was faced with some of the harshest of treatment during the internment, there was a word we often repeated: gaman. It means to endure, with dignity and fortitude. We did not permit them to strip away our basic humanity. We rallied, gave comfort to each other, and got through it. Gaman has been a steadying and comforting bedrock principle for me through these many decades. There are also many who understandably feel seething anger at what has transpired. They feel they now live in a nation they barely recognize, and they question whether we can ever again unite. When such passionate feelings arise, as they have and will, it is vital first to acknowledge what that really means. The answers are not what we might first assume. We are angry precisely because we love this country and want the best for it, and thus feel shame at what it has decided. But even our shame is telling, for we cannot feel shame for what we do not hold dear. We are upset because we love our family and friends but can’t understand how some of them voted as they did. But there again, only those truly close to us can cause us so much pain. These painful feelings, once examined, stem not from a place of darkness, but rather from a place of hope. It is precisely because we care so much that we mourn this loss so deeply. If we did not care about our country, our friends and family, our values, we could shrug our shoulders and simply move on. The fact that we do not speaks volume of our commitment, our principles and yes, our patriotism. The challenge before us is how to channel that passion into active civic engagement. There is an understandable impulse to disengage, to “unfriend” others on social media who disagree, to demonize whole groups as irredeemable racists and sexists. This may gain some momentary satisfaction, but with all its fury it solves nothing in the end. It certainly does not bring us closer to the promise of our country. Some sixty million Americans voted for Donald Trump, and I refuse to accept that most did so because of what he stands for, but rather despite it. And while some argue that enabling or ignoring his rhetoric when casting a vote makes his supporters complicit, I choose to find hope in the despite—in the fact that most Americans still agree that racism, sexism, and discrimination of any kind is wrong. For these voters in this election, these things sadly did not outweigh their bitterness and mistrust of the political establishment. Our answer must not be to shut them out as uncaring or bigoted, but to address their concerns, to win back their trust by restoring their hopes, to not turn our backs but to open our hearts. And to do so when all of our instincts cry out simply to cut them out—that is the measure of true commitment. Trump’s supporters have an opportunity as well to blunt the harshest elements of his candidacy and now soon his presidency. They can do so first by not belittling or ignoring the real pain and fear that many Clinton supporters now feel and are expressing, but by standing up to any who would take their candidate’s election as a license to hate. The business of governing is a serious one, and if they wish to see their candidate succeed, they can and should decry neo-Nazis, white supremacists, and other terror groups who hope to capitalize on fear and division and are a real impediment to their candidate’s legitimacy. And they can urge Mr. Trump to denounce these groups and to distance himself and his presidency from them. With the bulk of Trump’s supporters, we must find common ground, as tough as that presently sounds. But let me be clear on this other point: It is one thing to reach out, as we must and should, to white working-class voters who rejected our message in this election. But it is another thing entirely to oppose, as we must, the real threat to our values, progress, and rights presented by the incoming administration. While we recommit ourselves to being the champions to all middle class and working Americans, we can and will do so by holding Trump and his cohorts accountable at each step for their regressive economic agenda, by safeguarding our cherished liberties of a free press and the right to worship and assemble, and by opposing any policies or actions that might do damage to our communities, our economy, and our environment. We must remind Mr. Trump that he does not have a mandate to dismantle the progress we have achieved in reproductive and LGBT rights. When all the votes are counted, Hillary Clinton will have won a clear majority of the popular vote, likely by as much as two million votes, with a total count more than any GOP candidate has ever received. It is the height of irony that a candidate who cried that the system was rigged against him has become president by way of that system, comprising an outdated electoral system that operates to thwart the will of the majority of voters. And while we must accept the outcome of the election, we do not and will not accept the degradation or destruction of our rights, our democratic institutions, or our national character.